Here are the steps and Installation files presented here to get Bitcoin Realtime Charts in Metatrader 4 software at free of cost. If you are a core MT4 fan and a bitcoin trader then it could be more useful to you in performing technical analysis or doing prediction strategies over Bitcoin. Before configuring Bitcoin few words about bitcoin for those who are very new to Bitcoin – The Digital Currency Economy. Bitcoin is one of the first implementations of a concept called crypto-currency, The Bitcoin is a form of currency without notes and coins, it is a digital currency.Bitcoins are kept in a digital wallet which you can keep in your computer, or on a website online, which will manage and secure your wallet for you. The following video explain about Bitcoin in brief. 2. You must connect to at least a demo account. To create one, go to menu and select File -> Open an Account. And Get a demo account. 3. Now to to menu and select Tools -> Options -> Charts tab. In the fields “Max bars in history” and “Max bars in chart”, enter the largest number allowed: 9999999999999. After you click OK, the system will change this number to 2147483647 – the maximum bars the system MT4 can handle. C:Program FilesMetaTrader 4expertsscripts – if you use Windows 7 32-bit system. 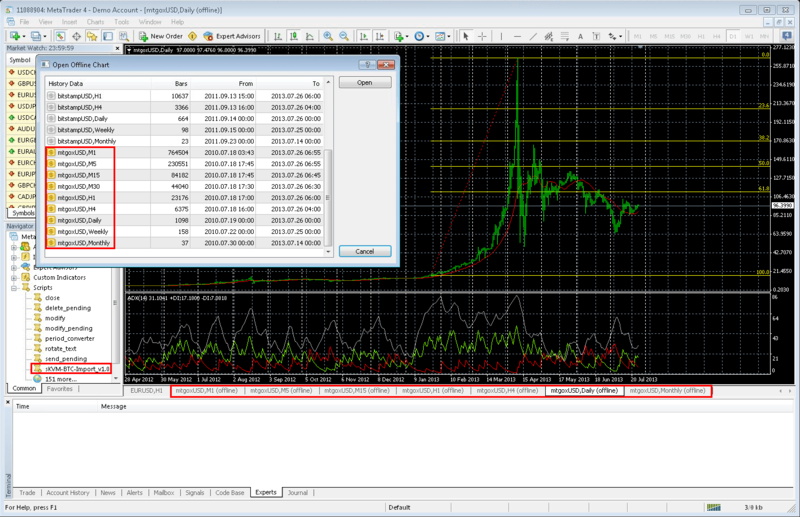 C:Program Files (x86)MetaTrader 4expertsscripts – if you use Windows 7 64-bit system. 3. After that restart the MetaTrader 4 terminal. Make sure that the terminal is connected and in service. 4. Open a new Chart Window for any forex pair you want (for example, EURUSD) and keep it running all the time! 5. Go to Scripts in Navigator window and double click on “sKVM-BTC-Import”. The script doesn’t need any special access to external DLLs, so it is perfectly safe to run! great work from you thanks. sir is it possible to take live data of excel sheet to mt4 by DDE link or some EA who is reading text file etc. Mr RAMDAS of http://niftyfno.forums-free.com made this type of utility but not for every excel sheet or trading platform. I am tradetiger user n can get live data of terminal on excel sheet . plz guide me to feed this to mt4. Yes it just import the data in realtime.The other Alternative is you can check with AVAFX demo account. Could you provide the sKVM-BTC-Import_v1.0 script file again please, it is no longer in dropbox. Or better still another one, which is not related to mtGox please? How can I reach you to speak to you. I need your advice wrt data feeds and signal system.